This potato program is intended for informational use only. For the best possible results tailored to meet your needs and soil type, check with your AgPro™ representative for specific recommendations. 32 oz AIM per acre Aid in air and water exchange AgPro’s™ water management tools aid in air and water exchange which is critical in stimulating microorganisms in preparation for planting. RECLAIM also detoxifies and flushes harmful effects of sodium or carryover herbicides.NOTE: *For pH higher than 6.8 and/or high sodium content use RECLAIM. Also good for chemically damaged fields. 8 oz RENEW per acre in watering solutionSpray in the seed row over the top of the seed Stimulate microorganisms and spur root growth This application will stimulate organisms creating an environment promoting a bigger root system and faster growth in the plant. 32 oz. AIM per acre Beneficial air and water management exchange Enzyme action at this stage helps the plant prepare for regeneration. In sodium soils, the plant is very susceptible to sodium uptake and cell eruption causing cell lesions creating a favorable environment for disease. RECLAIM flushes the sodium. 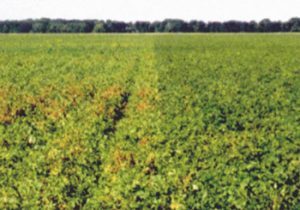 per acreSubsequent sprayings: 16 to 32 oz FOLIARPLEX per acre Strong root and top growth – eliminating 2 or 3 sprayings per season AgPro™ enhances the effects of herbicides, fungicides or insecticides. Aids in leaf intake of given application. At 1st spraying, the plant still needs the large dose of phosphorus for strong root growth. Later very little nitrogen is needed for top growth, but potatoes become heavy users of phosphate and potassium at this stage for crop growth and disease resistance. Each spray application can be applied with most fungicides and/or insecticides. We suggest using their lowest recommended label rates. FOLIARPLEX helps make the fungicides and insecticides act in a systemic way for longer retention and kill effects. Most farmers extend spray program 2 to 4 days beyond normal rotation, eliminating two or three sprayings per growing season. Apply 16 fl oz phLAME per 100 gallon tank mix with contact herbicides. Apply 16 – 32 fl oz SS 9 per 100 gallon tank mix with fungicide. We strongly recommend using an adjuvant with your potato program. AgPro™ specialty surfactants (SS 9, SPREADER STICKER, phLAME) have proven cost effective with spray applications of chemicals (fungicides, herbicides, pesticides) to allow lowest label rates with better results. The synergy can add potency and extend the chemical life and have allowed some growers to experiment and get exceptional results with well under label rates.